The Roadrunners play their first game of 2019 tonight as they begin what is to be a rather heavy month at home, on the road. 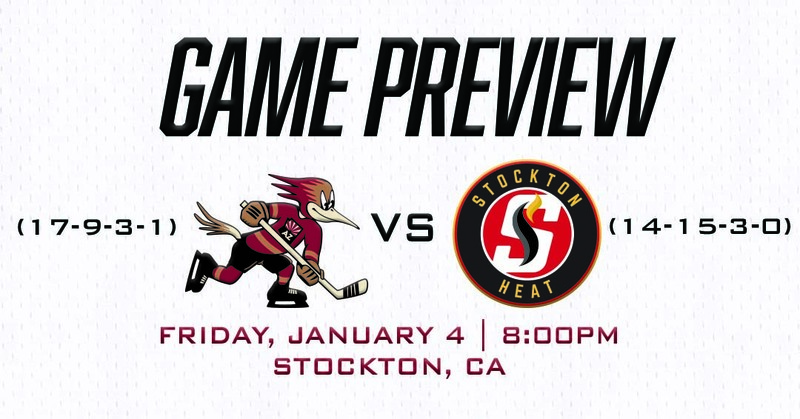 They'll take on the Stockton Heat for the sixth time this season, making only their second visit to Stockton Arena. All three of the teams’ remaining games will take place at Stockton Arena, where the Heat are 5-8-2-0 this year. The Roadrunners dropped their only previous visit to Stockton this season on November 16, a 3-1 loss. To begin a new calendar year, the Roadrunners will be following a marvelous run in 2018, where the team posted a 43-26-3-1 record, earning points in 50 of 70 games played, translating into a .664 win percentage. 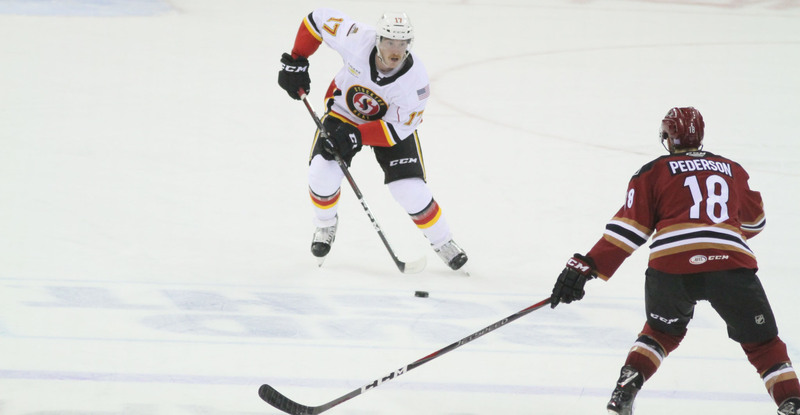 The Heat have struggled as hosts of late, going 1-4-1-0 in their last six games played on home ice, and have dropped seven of their overall last 10 games (3-5-2-0). Goaltender Calvin Pickard, assigned to the Roadrunners on a conditioning assignment on Tuesday, is with the team and is likely to play in one of the two games this weekend. He is to wear #30 with the club. Pickard has faced the Heat only twice during his 196-game AHL career, both starts coming during his 2015-16 campaign when he was with the San Antonio Rampage. The 26-year-old netminder has never appeared in a game against the Bakersfield Condors, who the Roadrunners play tomorrow night. He holds an all-time AHL record of 90-71-15-12 with a .915 SV% and a 2.59 GAA. The Roadrunners will be without forward Laurent Dauphin tonight, who was recalled by the Arizona Coyotes on Thursday. Dauphin is just one of four names to have appeared in all 30 of Tucson’s games played thus far, putting up 18 points (6G, 12A) in the process. BUNTING BACK? : Re-assigned to the Roadrunners from the Coyotes last Saturday, Michael Bunting is expected to return to Tucson’s lineup for the first time since December 5. The 23-year-old forward has 18 points (6G, 12A) in 20 AHL games this season, and in the three games leading up to his first-ever NHL recall, he put up a combined six points (1G, 5A). ALL-STAR STATUS: Defenseman Kyle Capobianco earned his second-straight AHL All-Star selection on Thursday. He is the only defenseman to currently lead his respective team in scoring, topping the Roadrunners’ charts with 25 (4G, 21A). He has five assists in five games played against the Heat this season and is coming off of his sixth multi-point performance (2A) of the season in Tucson’s 3-2 loss to Stockton last Saturday. CONSISTENT NICK: Forward Nick Merkley enters the night with points in four consecutive games, amassing five (1G, 4A) over that span. He registered multiple points for the first time since returning to the team’s lineup on December 12 in last Friday’s 5-2 win over the Heat. TEN: The Roadrunners are one of only three teams in the AHL without a single player in double-digits in goals scored; the other two clubs are the Ontario Reign and Rockford IceHogs. Both Adam Helewka and Hudson Fasching enter the night with nine apiece, while Lane Pederson sits close behind with eight.